Jacob Hollister is one-half of the Hollister twins currently making a statement with their footballing skills for the same National Football League (NFL) side. Although the twins didn’t attend the same college, they ended up on the same professional team as undrafted free agents signed after the 2017 NFL Draft. After joining the NFL, the Hollisters entered the record as the only pair of twins playing for the same team at the time, as well as the third set of twins to feature in the NFL in recent times. More details as you keep reading. The American football tight end was born alongside his twin on November 18, 1993, in Bend, Oregon, United States. He started his football career at Mountain View High School and proceeded to the University of Wyoming where he played with the Cowboys. Jacob Hollister is the name of his father while his mother is identified as Jennifer Connolly. Nothing is known about what his folks have been up to lately but we do know that they raised their children to work hard for their dreams. In spite of injury woes and other challenges, Hollister and his team were able to make it to Super Bowl LIII. 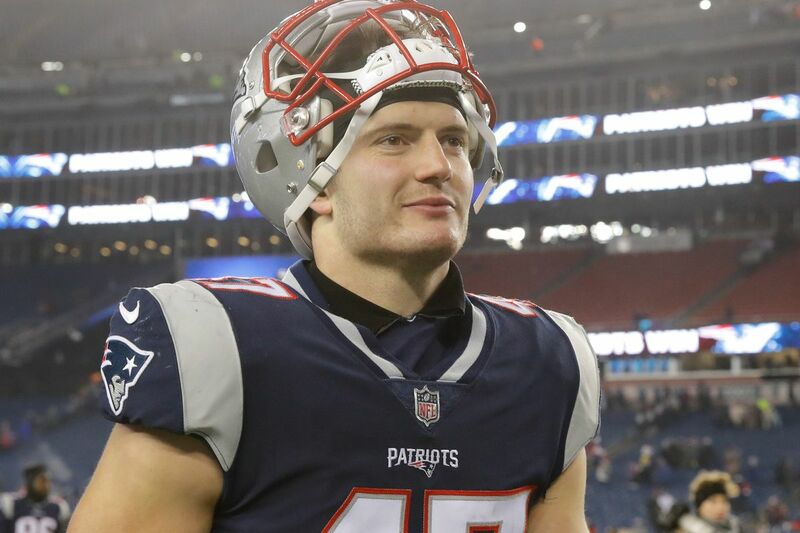 NFL’s New England Patriots signed Jacob Hollister to the side on April 30, 2017. The three-year $1.67 million deal guaranteed $90,000 and came with a signing bonus worth $10,000. The preseason kicked off with Hollister catching seven passes for 116 yards in a match they played against the Jacksonville Jaguars. He was roped in a competition for the team’s possible third tight end position along with James O’Shaughnessy, behind veterans Rob Gronkowski and Dwayne Allen. Against all odds, Hollister put up a good preseason performance and it didn’t go to waste. He snapped the spot as an undrafted rookie and subsequently entered the NFL proper in Week 2 where he appeared in a faceoff against the New Orleans Saints. He also recorded his first career catch for seven yards. His performance was enough to put him on the path to Super Bowl LII, though his team lost 41-33 to the Philadelphia Eagles along the way. All geared up for a new season, Jacob Hollister took charge of his position as the third tight end on the depth chart, falling behind veterans Rob Gronkowski and Dwayne Allen in the 2018 season. His performance was hindered by injury woes – hamstring and chest injuries which cut his time on the gridiron to a mere eight games. Consequently, he joined the injured reserve on January 8, 2019, but his absence did nothing to deter the Patriots from reaching Super Bowl LIII. The team will face the Los Angeles Rams. As mentioned earlier, almost nothing is known about his parents, Jacob Hollister and Jennifer Connolly. The tight end has only one known sibling – Cody Hollister, born the same day as his twin brother. The amazing two are both American footballers playing for one of the league’s giants. While Jacob signed a contract with the New England Patriots on April 30, 2017, his twin brother joined the same team on May 5, 2017, as an undrafted free agent. Unlike his brother, Cody plays in the wide receiver position. The wide receiver is also currently battling to wriggle his name off the injury list. After sealing their contracts with the Patriots, the twins entered the records as the only set of twins signed to one team in 2017 and the third overall to play in the NFL. Meanwhile, they were not always together on the same team before they turned professionals. Although they both attended the same high school – Mountain View located at Bend, Oregon, Cody moved on to play for the Arkansas Razorbacks football program at the University of Arkansas while his twin brother joined the Wyoming Cowboys – the team representing the University of Wyoming. Jacob Hollister is yet to get married and he does not have any children as well, at least, none that is known to the public. Jacob Hollister is physically fit for the position he plays in. His height of 6 ft 3 in (1.91 m) gives him an edge with a complementary weight of 239 lb (108 kg). His other body measurements are not known. His twin brother, on the other hand, stands at a height of 6 ft 4 in (1.93 m) and weighs 215 lb (98 kg).